I had a great Uncle Hubert and he was a farmer at heart. He and his wife Mildred, had a beautiful piece of ground, overlooking the reservoir. Hubert filled that spot with wild ponies, chickens, and a garden which was a good three feet deep in the richest soil that produced strawberries that burst when touched they were so lush. He had a magical hand with all things living. When I was in middle school, he did some janitorial work at my school. When lunch time came around I would steal away into the kitchen and he would be having lunch with the ladies. I would alway be treated to an extra piece of cake and a visit. This was back when the ladies would actually cook – and did it well. This is a Chicken Salad with no pretense, similar to recipes that came out of that kitchen – just good. I have it pictured with Iceburg Lettuce and a pickle, but it can be brought to another level with more exotic combinations, all up to you. 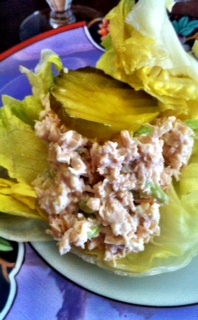 This entry was posted in Family, Recipes and tagged chicken, Chicken Salad. Bookmark the permalink.